Hot tub prices can range from a few hundred dollars for a blow-up type “hot tub” which is usually neither very hot or much of a tub, but hey, what do you want for a couple hundred bucks! The kids will enjoy this type of inflatable, vinyl tub and if it gets a hole in it, a bicycle type vinyl repair patch can be used to mend the punctures. These very low end units are really portable, but do not usually come with a dedicated heater and rely on the heat from the pump to warm the water. While this works in temperate climates, as soon as it turns cold outside, the water may have a hard time staying at temperature, especially when the cover is off and the hot tub is in use. The next best thing are more solid surfaced tubs that still use an inferior grade of plastic such as polyethelene or other plastic material. These plastics usually bend, can warp and discolor in the sun, but again the price of these tubs is usually around $800-$2000 or so. The massage works fine as the jet count is usually limited, but these budget models usually do not include the highest end components since they must be produced at a low cost. In the lower range of hot tubs, you usually get what you pay for. This saying is not necessarily true as the price of hot tubs go up. 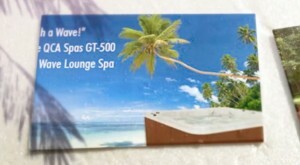 The first type of sturdier, longer lasting spa is made of acrylic. Most higher end manufacturers prefer quality acrylic to any other shell material. Many of these spa manufacturers that have been in business for over 20 years have settled on either Lucite acrylic or Aristech Acrylics as their preferred spa shell material vendor. The more robuse acrylic which is also more expensive to the manufacturer is the ABS backed acrylic which adds another layer of support and structure to the spa shell. This type of shell will have the least chance of warping, fading in the sun or cracking since it is specifically designed to be more robust than lesser materials. Hot tub cabinets also come in various grades of material. In the old days, a simple wine barrel-like casing could become a hot tub cabinet. As Jacuzzi and other companies refined the early hot tubs, more robust wood cabinets came onto the market that would remain for quite a long time. Then weatherproof PVC cabinets started appearing more often after the year 2000 and these types of cabinets have since become the low-maintenance choice for many consumers as the PVC materials have come to look more like natural wood grain. A good PVC cabinet will not fade in the sun and does not need annual staining and restaining like the wood cabinets do. By knowing what features and accessories are must-haves, and which ones can easily be left off, the spa price of a quality unit from a reliable source does not have to break the bank. Also when purchasing a spa in a state or country that charges sales tax (don’t most of them?..) the amount of tax that needs to be forked over to the government is directly proportional to the price paid for the spa. If a similar spa can be purchased for $5,000, and another enthusiastic retailer decides to charge $10,000 for an almost identically outfitted unit, then not only does the buyer have to pay more dollars to acquire the spa (which may very well contain a disproportionate amount of retail store markup), but also must pay the additional tax to the government on the higher price. For example if the spa is bought in California in a district that has benefited from the recent sales tax decrease there such as in National City or El Cajon, then even at the new lower 8.75% sales tax, the extra $5,000 in retail markup costs the buyer an additional $437.50 just in sales tax. So shopping wisely can save more money than any reason a salesperson proclaims their spa is better than all the rest. Saving $5,437.50 on a hot tub goes a long way toward making up for one spa that may use $100 more in energy a year than another. In other words, great savings when buying a quality tub can be the single best way to start off on the right foot with hot tub ownership. This example is just an illustration, but the more that is paid for the spa, the more sales tax will be added on top. Hot tub prices are just one expense to consider. Just like owning a car, there is periodic maintenance, wear and tear, filters that need replacing and the cost of operation. On this site there are many hot tub spa tips that will help save money on hot tub operation, repairs and use.